Happy Anniversary! What anniversary you wonder? 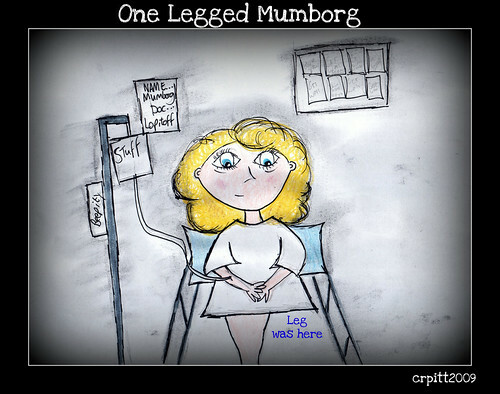 It has been three years since the mumborg became legless. No she hasn't been on a booze filled rampage for three years, she has been without her left leg. They parted ways, the reasons where irreconcilable differences. Mum wanted the leg to work, the leg wanted to stay as an uncooperative limb, refusing to work and just hung around all day, doing nothing and watching daytime TV. Option C: Lots more operations, lots more pain and no real positive outcome guaranteed. *If you choose Option A, death may occur. The Mumborg went with Option A, luckily the deathlike side effect didn't occur. As I am typing this my mind wanders over to the ultimate question, which is of course 'Cake or Death?'. 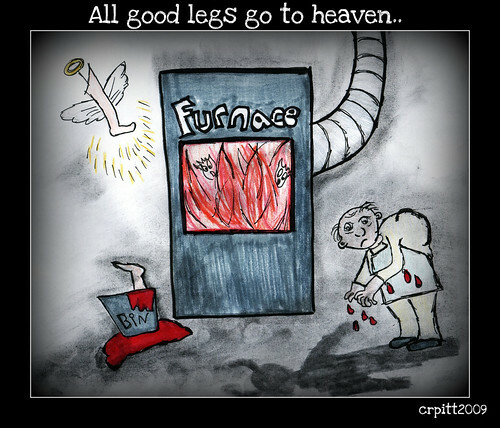 A moment of true comic genius by Eddie Izzard, but probably not what the mumborg was thinking, when she made the decision to have the leg removed. I can't quite believe that three years have gone by! The decision was definitely the right one for mumborg, although having one leg is definitely something to get used to, for her and for us. She managed a whole two years of not being in hospital (a record), before succumbing to another bout of Guillain-Barré syndrome last December. This left her with no energy or strength at all and was/is a bit like a weeble, with no balance. So when she managed to escape from hospital after nearly six months, she needed/needs a lot more help. Luckily, if you can call it that, building work was done whilst she in hospital and she returned to much more disabled friendly home. If anyone wonders why The Doodologist was born, well this is a big part of it. I was training to be a counsellor and was just about to be let loose on clients, when it got really serious with mumborg's health. It wasn't appropriate for me to be counselling others, with such turmoil going on. When mumborg came out of it on the other side and was doing well, I thought about going back into the world of counselling, because I loved it. Unfortunately my heart just wasn't in it and I wanted to focus on something slightly more happy. I hope to wander back that way, some time in the future, as I do believe art and therapy play well together. The more blogging I was doing back then, the more drawing I was doing to accompany the blog posts, as sometimes it was easier to draw a picture. 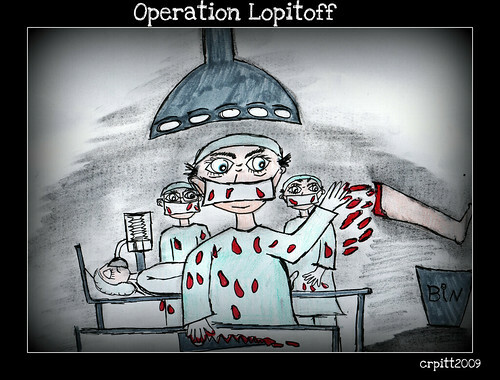 So the doodles in this post are from the 'Operation Lopitoff' post I wrote three years ago. These doodles then led me to believe that I should explore the world of creativity more and I ended up setting up my own business as 'The Doodologist'. The doodles have changed a lot and so has my outlook on life, which may sound exceptionally cheesy, but so bloody what. You never know what is going to happen next, so if you have an opportunity to do something you love, go for it. I was lucky and got help from The Prince's Trust (because I was 'just' young enough and poor/disadvantaged enough). 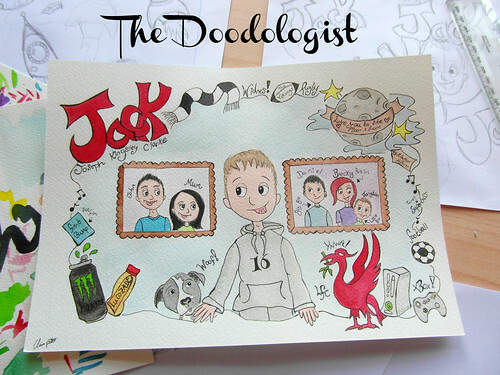 Happy Birthday Jack - A4 doodle commission, celebrating his 16th birthday. I wont be making any huge piles of cash, but that is not why I am doing/doodling it, I needed something to do whilst looking after mum and planning for the future. So I am still planning to take over the world, one doodle at a time. It just might take a while to get there. Life does take some interesting turns at times and both you and the mumborg have come out the other side of the adventure with a new way of being in the world. You have an interesting story. No one would ever connect an amputation with doodling. Wishing your mom well. Thanks for the Eddie Izzard clip - new one for me. Love Eddie Izzard, so glad you enjoyed it! Thanks for sharing your story. I wasn't around 3 years ago in the blogworld, but am glad to put some pieces together. I think things happen for a reason, and you have been guided to your doodle passion. Continue on and see where it goes. Anything that you can do and love, and still be home where your needed is a definite blessing. I have blog known you for a long time though, just not altogether? Not sure what the reason was, but I am learning to just go with the flow, as there is nowt else you can do. Ah did three years pass already? Sheesh. A big hello to Mumborg! *waves to Mum* I'm just so happy that you were also able to go after what you love to do, not many have the courage to capture their dreams and they just stick to the general saying "ohh I wish I could do that"
I won't ramble too much, but I'm glad you can be there for you Mum and know I am always around, encouraging and supporting you throughout your career! This will never change as you're always there for me as well. The "buckets" of money will come eventually, I've no doubts about that at all ^_^. 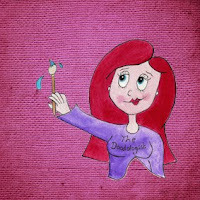 You doodle from the heart and not because you want to earn quick cash. I think that's the most important thing huh? You have grown SO much with your skills, doodle composition and color use! It makes me so happy and I can't wait to see what doodles you'll show the world soon!! Crazy aint it dude! I will pass on the wave to the mumborg. I am SO happy that I have had you as my doodle mentor, not sure I would have got this far without all your help and support. I hope you realise just how inspirational you are to people and so generous with your time, it is MUCH appreciated. Can't wait to catch up with you in the real world again! Wow, so my comment really did disappear from over here, huh? Well, I sure the heck can't remember what all I blathered on and on about so suffice it say that it sure hasn't seemed like three years since your Mum went under the knife but I bet it's been marvelous to have her home rather than in hospital all the time. And obviously some good definitely came from the bad as without all of that, the Doodologist may have never found her place in the world and what a shame that would have been! Hopefully now THIS comment stays put! Linda- This post obviously hates you, as now the reply function has gone all wonky? sheesh!